Alyssa Sanchez knows when she’s found a place she likes. With grandparents in the Dominican Republic, she has traveled extensively throughout the Caribbean and explored Europe and North Africa. She’s especially excited about her location: UNCG, where she is a freshman in the Lloyd International Honors College. 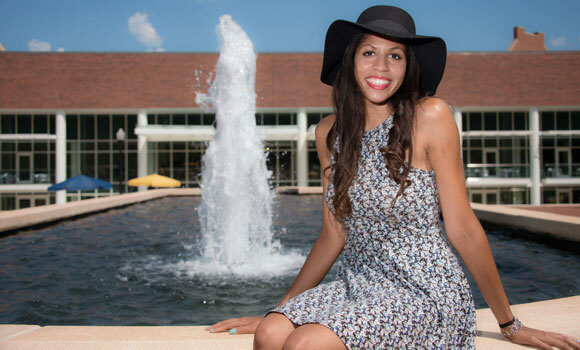 Awarded UNCG’s prestigious Katharine Smith Reynolds Scholarship, Sanchez is studying biology and plans to pursue career in health care, possibly as a physician’s assistant. Sanchez also has a passion for community service fueled by mission trips she has taken in the southeastern United States and to Guatemala, where she has worked closely with the homeless and youth. Those trips aren’t unusual for young people committed to social justice, but Sanchez has taken her commitment several steps farther. Advised by her mother, who has created several businesses, Sanchez launched a nonprofit called “A Mere Student” during her sophomore year at Leesville Road High School in Raleigh. She met with nonprofit leaders in the Triangle to assess areas of critical need and rallied student volunteers to help her with an array of service projects. She has organized food drives for needy students, gathered more than $2,000 worth of clothing and toiletries for the Durham Rescue Mission and collected toys and back-to-school supplies in Wake County. In the coming year, she hopes to shift the focus on her nonprofit’s work to Greensboro.